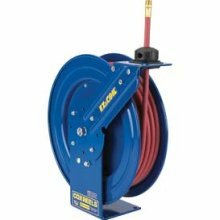 Coxreels EZ-P Series Safety Series Performance spring driven retractable hose reels have share the same high quality components and innovated design as the P Series, with the added feature of Coxreels patented EZ-Coil controlled retraction. EZ-Coil safety reels retract up to 80% slower for increased operator safety and require no power source to operate. The reel and its components last longer not having to withstand the slamming action at the end of the recoil cycle. EZ-P series hose reels are available in low, medium and high pressure for use with air, water, oil, grease and other fluids. Check out all of out air fittings that will fit with the Coxreels perfectly! All Coxreels are built to order, please allow 2-3 weeks for delivery. SPRING DRIVEN FEATURES: Auto Rewind Easily Wraps, Stores & Protects Hose Heavy Gauge 1/4” Steel Base & Support Post Factory-Matched Cartridge-Style Spring Motor Brass NPT Swivel Inlet Machined From Solid (Zinc Plated Steel On HP Models) 1” Solid Steel Axle With 1” Lubricated Precis..
All Coxreels are built to order, please allow 2-3 weeks for delivery. SPRING DRIVEN FEATURES: Auto Rewind Easily Wraps, Stores & Protects Hose Heavy Gauge 1/4” Steel Base & Support Post Factory-Matched Cartridge-Style Spring Motor Brass NPT Swivel Inlet Machined From Solid (Zinc Plated Steel On HP Models) 1” Solid Steel Axle With 1” Lubric..